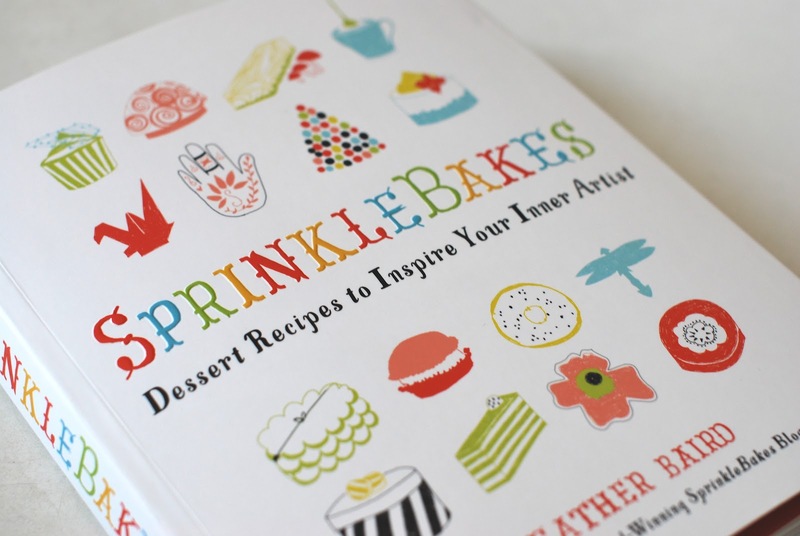 Heather Baird, author of the heavenly Sprinkle Bakes website just released her first cookbook. Being an avid blog reader, I pre-ordered a copy. I expected it to arrive in exam time and give me something to leaf through. As it transpired, the book was released early. Here are my initial thoughts. I got my copy for EUR 9.90 ($13.15) + P&P off Amazon.com. Even though I live in Europe, I opted for the American site as the .co.uk version turned out to be just a little pricier. Here‘s the link to the book page. I believe any book to be a bargain at such a price. Cheers to Heather for making it so affordable! The cover chosen matches the SprinkleBakes website. It’s pretty, attractive and ‘clean’. The title also makes use of the same font style and is embossed. I love this. I can’t stop running my fingers over the title page. Moreover, the book is predominantly white which makes both the light and bright colours which are used POP. Being slightly smaller than an A4 paper and containing almost 300 pages, this book is nicely sized too. Thirdly, content: An innovative and informative read. Although I expected the feeling of opening this book to be on a par with logging onto the oh-so-amazing SprinkleBakes webpage in terms of photography and general awesomeness, I knew that few recipes were going to be repeated. I personally wouldn’t have minded if half the book were a copy of that which is already available online. But I can of course understand what the author had in mind and appreciate such a decision. Point made. Baird includes helpful prefatory material which covers baking equipment and art supplies which one should have at hand as well as some ‘baking commandments’ which may help both novices and experts alike. It is in a similar spirit that many of the recipes are coupled with ‘suggested variations’ and the pages are filled with helpful tips and techniques. The body of the book is subsequently divided into ‘Blank Canvases’, ‘Line’, ‘Sculpture’, ‘Colour’ and ‘Mixed Media’. Each heading contains sub-headings which group together the section’s contents. Even though this startled me at first, I became accustomed to the divisions in a matter of minutes. They’re ordered and logical. AND they encourage you to think outside of the box. Cliche, but true. The book is centered around artistic representations. Baird includes large photos of most of the final desserts as well as collages which portray parts of the method in visual form. Have you come across this book yet? Or are you tempted to get it? Let me know in the comments!